AEON Credit Service - Dinn! AEON Credit Service Corporation aims to become the first consumer credit company in Malaysia that has a successful digital branch service. With innovated sales strategies, now more simplified, inside the new branch design the client can entirely act on his own – thanks also to a fast and efficient self-service system. AEON Credit Service Corporation represents one of the main consumer credit companies belonging to AEON Japanese financial group. Up to now, the 80% of its branch space has been dedicated to the back office and the administrative operations, just the remaining 20% to the sales. A further critical aspect of the existing format concerns the technology: though already present, customers had never actually used it so far. Clients rather relied on the consultants to ask for information, make transactions or start procedure to take out a mortgage, for instance. DINN! renovated the whole bank landscape in order to transform the space by giving much more attention to the products offer. 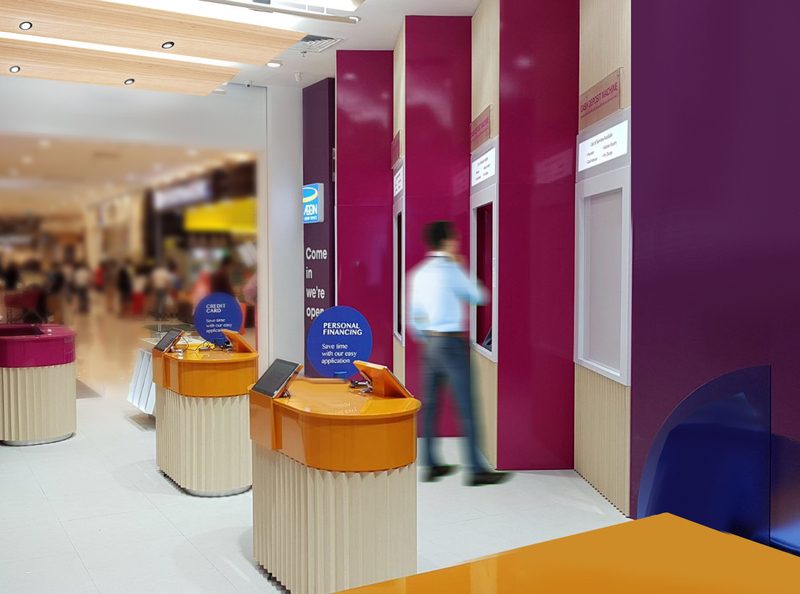 Starting from the traditional style of AEON branch, the new design wants to create a fresh digital branch provided with a comforting atmosphere and a 100% self-assisted space, inspired by the retail concept of the “fast convenience”. 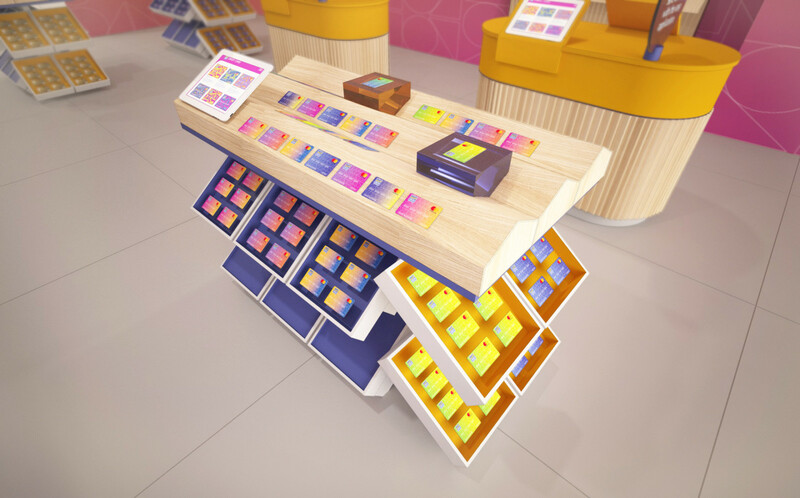 “AEON Digital Branch represents a breakthrough in the credit stores design world: a new landscape where convenience, human-technology interaction and customer service melted into a surprising and actual human-centric place. The result is a new design concept for consumer finance business that at last overcomes all the psychological barriers existing between customers and bankers and helps to simplify and speed the lending procedures and the cross-selling opportunities as well” claims Massimo Fabbro, DINN! Chairman & Founder. AEON branch transformation project offers advanced technology services made available to the clients. It also highlights the role of the bank’s staff as facilitator, that means it assists, drives and supports clients, giving them a satisfactorily new bank experience. 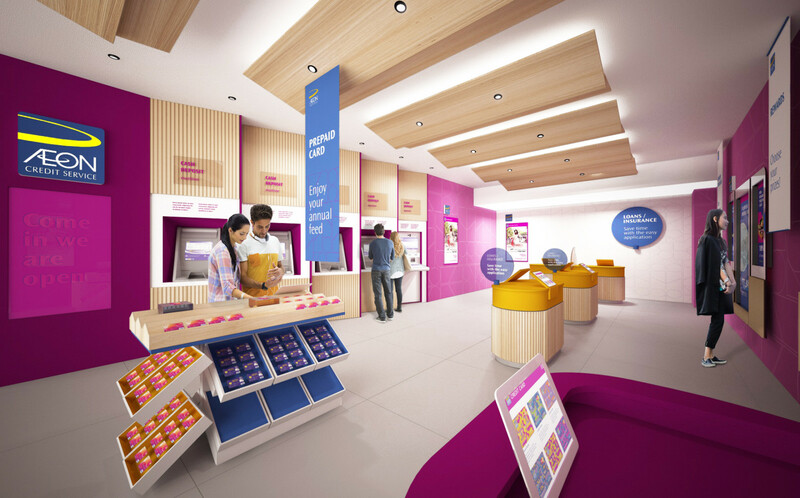 The new digital branch concept has been designed with a retail landscape that recalls the convenience store’s one – this surprising design choice, inside a traditional bank, invites customers to experience the space in a completely different way, that underlines the staff efficiency and the innovative products offer as well. The presence of a warm and accessible technology conveys an easy and clear dialogue with the machines, thanks to the high-tech high-touch approach, especially designed to promote the smartest human-digital interaction. This way all the clients can manage step by step the operations indipendently, within a comforting space, experiencing a valuable and satisfying customer journey. This new accessibility is fostered by the facilitators: AEON consultants guide customers interacting with technology, whenever their support is required. Their expert business advice and assistance to the clients contribute also to the growth of the product sales within the branch. The fresh digital branch landscape highlights the new products (credit cards, mobile applications and more) in order to boost the cross-selling and make people move towards new digital channels. In order to create an innovated selling space, where both the promotion and the product sales stand out thanks to a nontraditional bank approach, DINN! designed three different areas, each one representing a new customer experience solution. INTERACT & PAY where the client can manage all kinds of transactions according to his own needs, in an efficient way (even assisted by facilitators). First AEON Credit Service digital branch has been opened in Kuala Lumpur, Malaysia, in September 2017. Next pilot will be launched in 2018. Piraeus Bank E-branch made strike!